Fairy gardens are all the rage right now. They are easy to make and there are tons of ways to use them. People can put them in their landscaping, take them to work, put them in their children’s bedroom and give them as gifts. People love these little fairy gardens. They can customize one to fit their own personality or if they are making it for someone else — they can find small items to go in the garden that that person likes. These little gardens are so versatile. This pack will help you grab the attention of this community. You’ll get a report to use as an opt in to captures names for your email list and then you’ll also get 5 “Top 5” lists. This list is all about products that will help them garden. Definitely a money maker. 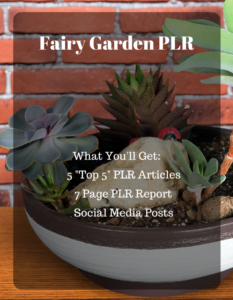 7 Page PLR Report on How To Make a Fairy Garden – Trending Right NOW! This report is 7 pages and has 1,986 words of content called “How to Make a Fairy Garden”. You’ll get a brief intro, four chapters and then a conclusion. Get it in both Text and Word format. You can use this as an opt in report or an ultimate blog post. You’ll be able to include Amazon affiliate links if you add it to your site. Then turn create power point slides and turn it into a slideshow to put on sharing sites. People love to read Top lists. They really like lists about products they are thinking about purchasing. The Top 5 articles give them choices and then based on what they are looking for they will find a product they want. It gives you a better chance of having someone click through your affiliate link. You can use these in your email as an auto responder series or on your blog. You could even repurpose it and use it for both. Take the blog post and load it up on your site. Then send a brief paragraph letting your email list know that the article is up. You’ll also get Tweets and Facebook posts for the report and the Top 5 articles. You’ll get 5 Tweets and Facebook posts with the report and 5 with the Top 5 articles! That is a total of 20 social media posts! They come in a text file, so that you can easily copy and paste them into whichever social media platform you want to use. Just add your link and an image. Your audience will love these! The Facebook posts are tips on each of the topics for the report and Top 5 articles, so it encourages people to click on the link and read the rest of the post or sign up for the opt in. You’ll get this PLR bundle for only $12.95!